We took Kairi out camping for the second time last weekend. 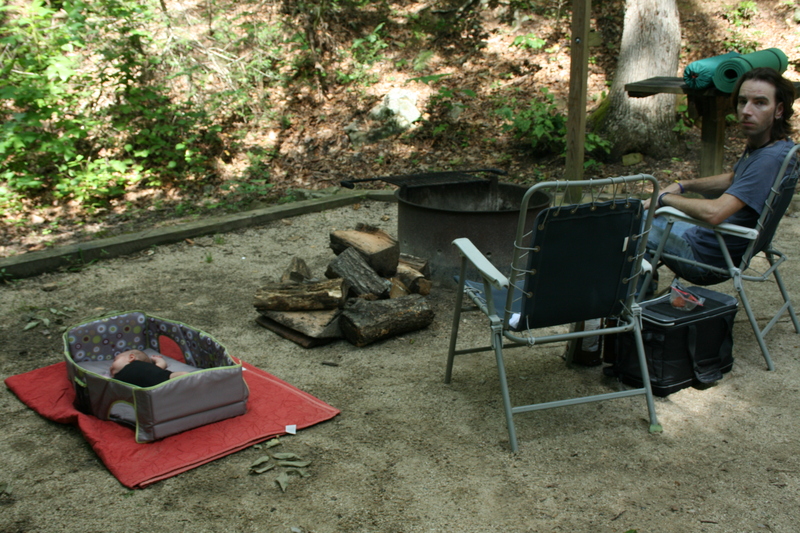 The first time, she was only five weeks old, which made her a pretty easy camping buddy. The trip was definitely different with an infant, but she didn’t require a lot of extra work at that age. Now, she’s 9 months old, crawling, and very curious, so we knew we were going to have our work cut out for us. 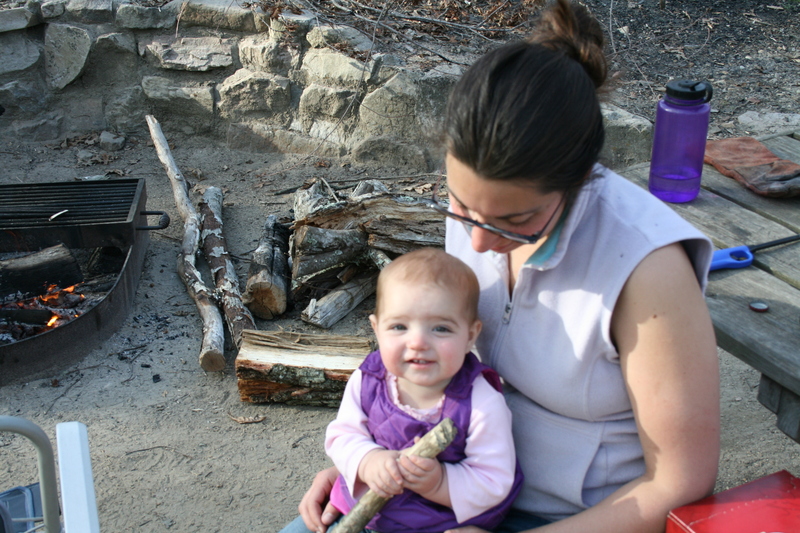 Still, camping is a big part of our family life, and we both really needed a trip out into the mountains, and we figured we may as well get her started early so she grows up with camping being a normal activity. 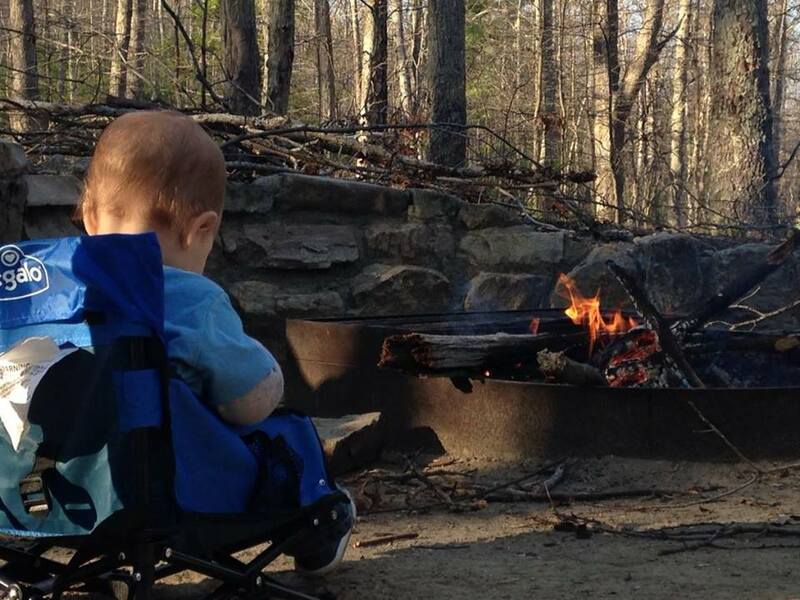 Kairi’s first camping trip. She got the relaxing part pretty quickly. -Babies eat dirt. I knew this. I knew it without anyone having to tell me. I knew it because every website I visited and parenting group I asked for tips in said, be prepared for baby to eat dirt. So I was. But knowing still doesn’t really prepare you for exactly *how* much dirt she would eat. And we were mostly okay with it. Leaves and rocks we tried to keep away from her, and then once she got interested in the fire ring where the dirt was more ash than anything it became a challenge, but yes. She ate dirt. I’m pretty sure she’ll eat worse as she gets older. Oooh, what’s this stuff? I bet I can eat it! -You really don’t need as many toys as you think you will. Kairi doesn’t have a lovey yet, so we just brought a bag full of the toys she’s been playing with the most. 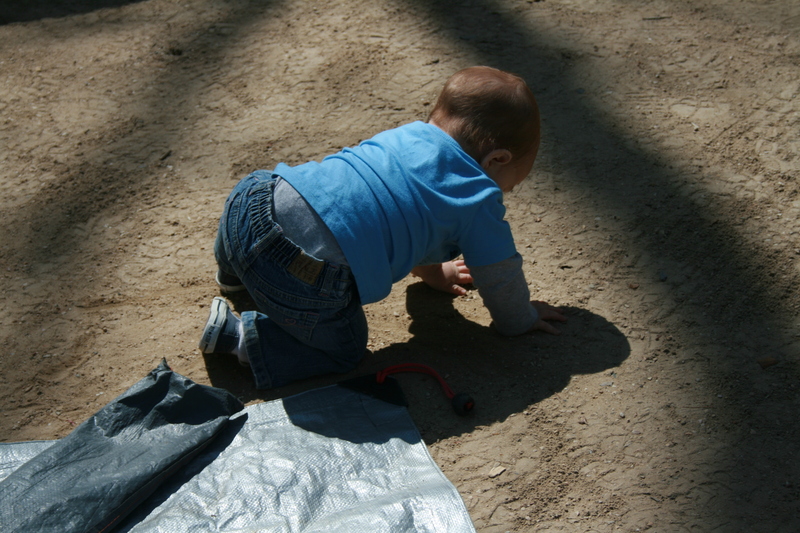 The first thing we did was lay down a tarp and empty her toy bag onto it, which distracted her for all of about two minutes before she found the dirt. 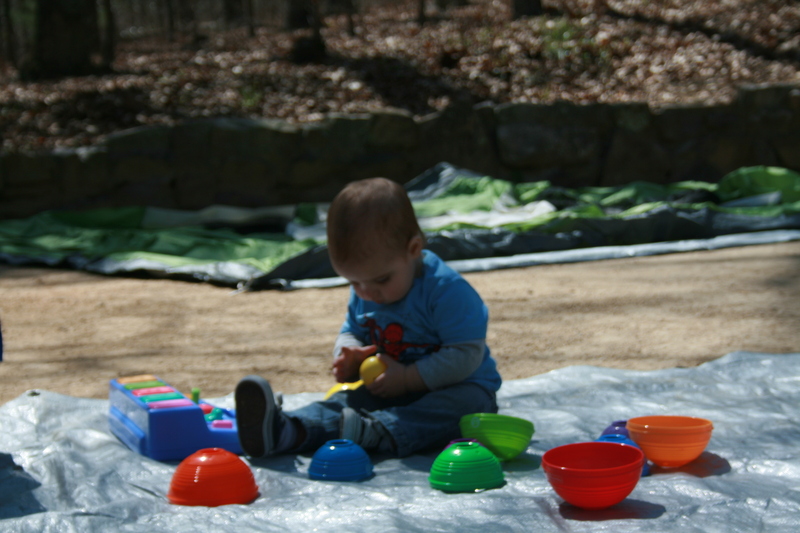 I don’t even know if a lot of toys will be more useful as she gets older, when she gets better about not putting everything in her mouth, since there are so many natural “toys” all over the campsite. This might not be the case for every baby, but ours was pretty content to explore all the new stuff. The only things she wanted with any consistency were her sippy cup and snack bowl. 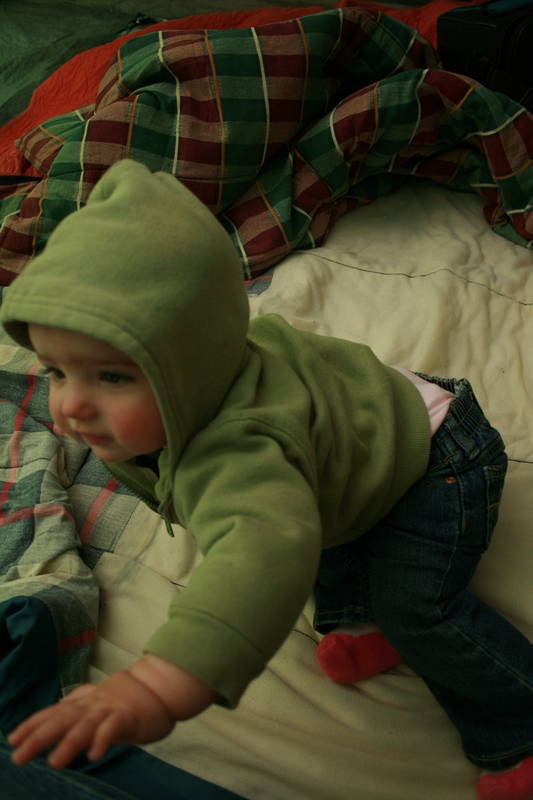 This taken just minutes before the above shot of her crawling right off the tarp. -You do, however, need as many clothes as you think you will. And probably more. We were well prepared for this and ended up bringing more than we needed, though I think if we’d stayed the second night we would have had just the right amount. She got messy. Not just dirty, but with her food as well. We didn’t bring a bib, but it wouldn’t have mattered, since she managed to stick her hands right into my plate of lentils and then smeared them into her hair, her pants, and all over mommy. The next morning she got eggs all over her shirt. And then there’s just the weather. We had a temperature range of over 40 degrees from night to day, so we needed a lot of layers to keep her comfortable, especially at night, and then to strip down to something lighter as the day got warm. On a longer trip I would have been fine rinsing her clothes out and letting them air dry, but for a short trip like this bringing half the clothes she currently fits into turned out to be a good idea. She looks ready for a day in the woods! -Sleeping trouble is amplified. This is the reason we ended up going home late on our second day, rather than staying the second night and packing up that morning. This was also the only problem Kairi had the entire trip. She isn’t the easiest sleeper at home. We co-sleep at night, which I figured wouldn’t be an issue camping since we were used to it, and it would give her something familiar. But she really, really struggled at night. Granted, it got down into the mid 30s, so even Billy and I were not at our most comfortable, but Kairi would not fall asleep unless she was suckling, which made things very uncomfortable for me, and she would cry if one of us shifted and she fell off the breast. However she also had a hard time taking naps, and it was rather warm during the day, especially in the tent, so her trouble was not entirely temperature-based. We didn’t take the pack and play because we figured we didn’t really have room for it in the car, and we didn’t expect to actually use it. We wouldn’t need it during the night, and during the day we figured she would only fuss if we had her in that while we were walking around where she could see us. But it turns out, we really could have used it for nap time. We think the openness of the tent made it really hard for her to fall asleep, so she would only nap if Billy went in there with her. 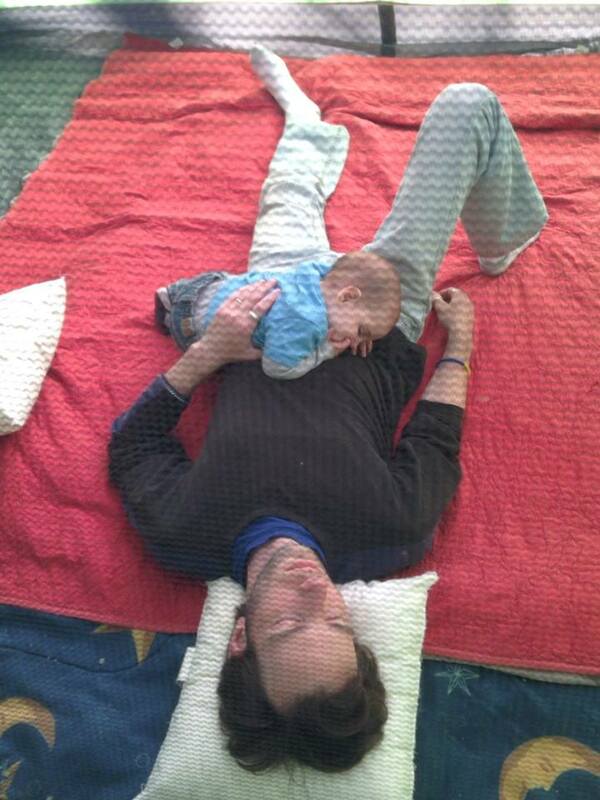 Which was great for him–daddy naps! But it meant we couldn’t take advantage of her napping to have some quiet time where we could talk or just sit together, and it also meant that at night when she got tired well before we did that we couldn’t go ahead and put her to bed. She wouldn’t even fall asleep if we were wearing her–on a three mile hike, she sucked on her fingers and rested her head against my back but never actually went to sleep. I don’t think there is anything we could have done differently on this one. If we’d had the pnp she probably would have napped, but it wouldn’t have helped night sleeping. All I can think is that in this regard, maybe she really wasn’t ready for such a radically different sleeping situation, and we should save our next trip until she’s sleeping through the night, or at least doesn’t need as many daytime naps. He’s definitely not complaining about the napping situation. -It’s a lot of fun. It’s different–very, very different. Gone are the days of opening your first beer at 10am and spending the entire day reading and lazying about, napping (amongst other things) whenever the mood strikes, and sitting up with a bottle of wine while you watch the fire die. It’s all about baby. We never expected it not to be. You have to manage your time differently, particularly when it comes to nighttime, and make sure everything is cleaned up and ready for the night before the sun goes down. You can’t help each other as much, since someone has to make sure she doesn’t climb into the fire pit, crack her teeth on the rock she just picked up, or go tumbling down the steps leading up to your campsite. You need to have more of your day occupied (this one actually suited me just fine–I love taking hikes, while Billy is more of a “finish 3 books in one day” sort of camper, so the extra walking I only found to be a benefit!). But seeing how absolutely happy she was to just be outside with her two favorite people easily makes up for the changes. We might try again next month if she’s sleeping better, but if not we’re definitely going to when we go visit my parents up in Canada this June, and then at least once more towards the end of the summer/early fall. “Reading” one of her bath books in front of the fire. I’m not unprepared for the possibility that as she gets older, she’ll hit a point where she doesn’t want to camp with us. Whether that happens when she’s a toddler and doesn’t want to leave the comfort of her own home, or when she’s a teenager and is too cool for camping with her family, I know it will happen at some point. Until then, we’ll keep going. We’ll let her eat dirt, and play with sticks, and “help” with setting up the tent, and with any luck, she’ll continue to love it as much as we do. Ready for my turn to tend the fire, mom!